Fabric structures vary vastly from other forms of building materials. Their lightweight and versatility in shape and structure provides a unique range of dynamic and exciting three dimensional options. Fabric architecture covers not only complex tensioned membrane structures through fabric engineering but also beautiful and unique fabric sculptures and shade structures. Expert tensile contractors Architen Landrell aim to bring you the best in these visual delicacies. Having long been used in tent structures, where guy ropes provide tension to the fabric that allows the tent structure to withstand heavy loads, these principles were only adapted to create tensile membrane structures in the last few decades. Most commonly used in the construction of tensile structures is PVC coated polyester, chosen not only for its excellent strength, flexibility and translucency but also its impressive design life of 15 to 20 years. It is mainly used for exterior canopies and its wide range of colours and suitability for printing also makes it ideal for banners. Also widely used for permanent exterior structures is the strong, durable and low maintenance PTFE Coated Glass Cloth, which has more than 30 years design life. It is completely chemically inert and resistant to moisture and micro-organisms as well as having good self-cleaning properties. Alternatively, Gore Tenara can be used. This is a UV resistant, chemically inert, easy to maintain, versatile tensile membrane to include in any architectural fabric project. 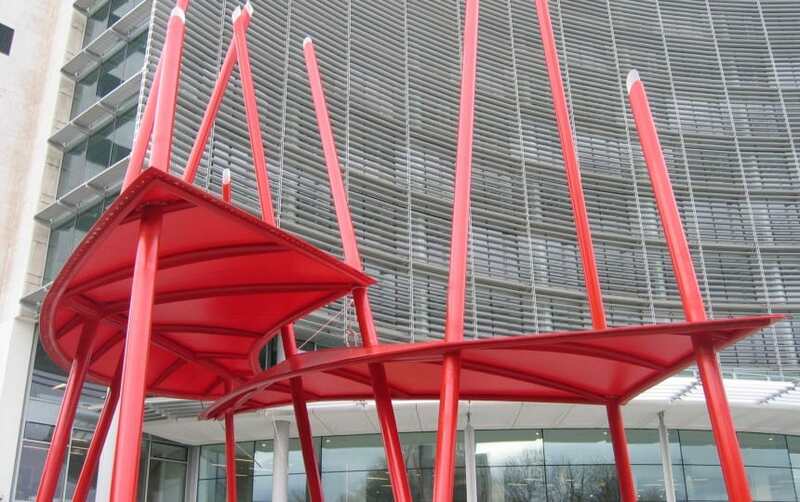 It is essentially a weldable form of PTFE offering strength, flexibility and longevity as well as unrivalled aesthetics and its high crease resistance makes it effective for demountable and retractable canopies. A good example of a Tenara structure is the Eat Street project at the Westfield Shopping Centre in London. One of the major advantages of fabric architecture is that very few components are required to create a structure and the ingenuity and scale of fabric structures is as boundless as the extensive freedom fabric membrane structures offer for imaginative designs. Fabric structures are not simply limited to creating fabric buildings, they are also very effective for creating entrance canopiesand walkway canopies. This is evident in Architen Landrells entrance to the O2 Dome at Greenwich in London. Fabric structures are often used as an inspirational form of architectural fabric at sports grounds. 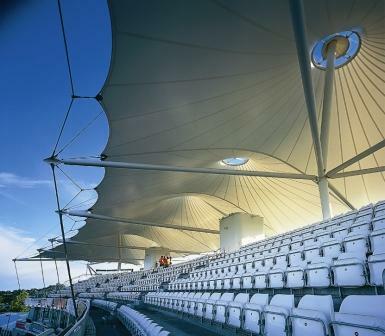 The impressive Hampshire Rose Bowl includes an iconic fabric covered structure as part of the county cricket centre. A similar design was created at the National Tennis Centre in Roehampton, where a tensile fabric forms an unforgettable entrance canopy. In contrast an iconic kilometre-long continuous 35,000 square metres tensile membrane roof covers retail units at the McArthur Glen Designer Outlet Village in Ashford, in Kent. The fabric structure has a dramatic impact, giving the conventional shopping experience an entirely different environment. Architen Landrell is constantly evolving new and exciting ways to use tensile fabric in exterior projects and staff are keen to push the possibilities of fabric materials to the limit.